16 inch front wheel on the F, 18 for the FII. Longer swingarm, different suspension setting. Different carburator setting : 110Cv instead of 116, and 9,0mKg instead of 9,3. Changes on oil circuit by adding an oil radiator and an other oil pump. It's possible to "upgrade" a SC15 (or SC16) by replacing the single pump with a double one with the corresponding oil pan from an SC19 (or SC20). 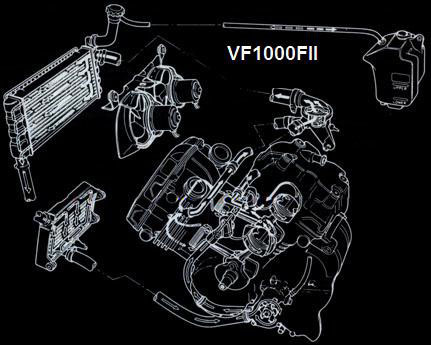 After you will have to adapt an oil radiator from a SC19 or from an other motorbike. On the left, the one with the holes to plug an oil radiator, and on the right the one without the holes. 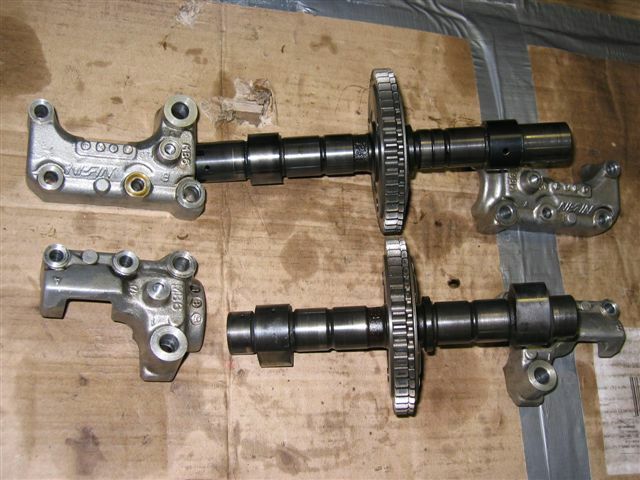 They increase the length of the camshaft bearings (and so the camshaft themselves) on the SC19 and SC20. Changes on the water circuit. The second radiator is in the head light fairing on the F, in the cowl on the FII (like the VF750F). Position of the thermostat is different, on the left for the F, on the right for the FII. First ratio: 1,889 for the FII, 1,971 for the F.
Oil radiator on the FII, and not on the FG (5 Kg ).